If there are multiple people in a conversation, an INFJ will typically seem quiet and spend more time listening than talking. They may seem comfortable in social situations, responding as-expected and carrying on conversations easily. Arguments and debates make them uncomfortable, even if they’re not involved. They may step-in to try to place peacemaker if there’s a risk of harmonious interactions being disrupted. 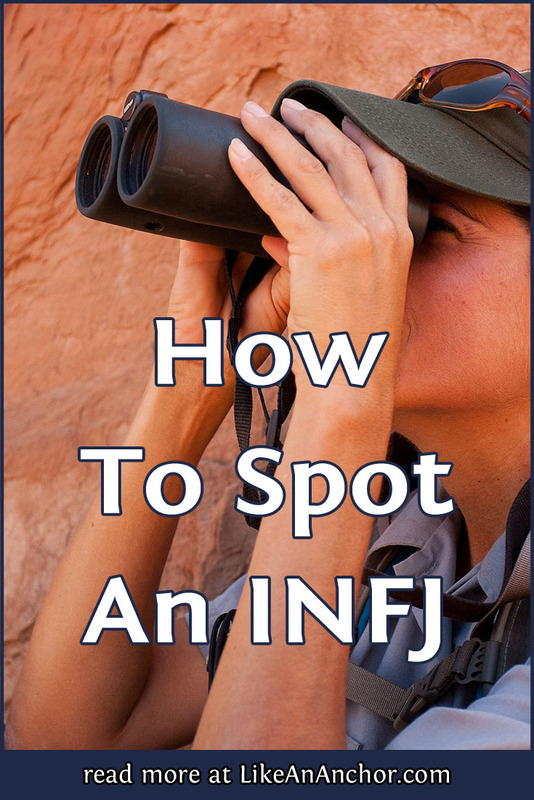 You’ll often spot INFJs near the edges of rooms either by themselves or with small groups of other people. If they have friends in the group, an INFJ will tend to stay pretty close to them and/or keep coming back to them. They may disappear for a few minutes, sometimes quite frequently, because they need a short break from socializing. You may find them trapped by a complete stranger who’s pouring out their life story and asking the INFJ for advice. They’ll want to resume conversations that you had days or weeks ago because they’ve finally finished processing it and have something else to add. They seem weird — like their minds don’t work the way most other peoples’ do but somehow it makes perfect sense for them to be like this. They spend a lot of time in their heads and may drift into thought even while you’re having a conversation. They care deeply about making sure you’re okay and maintaining harmonious interactions. They’re very likely to speak up and defend others, but much less likely to defend themselves. They seem both eager to connect and very guarded at the same time. They can see questions and issues from multiple perspectives, and may have trouble deciding which side they’re on. They’re more intelligent/intellectually minded than they seemed at first (alternately, if you first saw them when they’re being more logical, they feel things more deeply than you first assumed). They like order in their outer worlds (though they may be the only ones who understand how it’s organized), but can be surprisingly laid-back and indecisive about things. You might feel more calm when you’re around them, as well as comfortable opening up and being yourself. Any one of these traits could apply to a different personality type than INFJ, but if you start seeing a lot of these traits in the same person then there’s a good chance you’ve spotted an INFJ. If you’d like to learn more about interacting with INFJs once you’ve found them, check out my post INFJ User Guide or my book The INFJ Handbook.